(Nanowerk News) MicroRNAs are essential regulators of the genetic program in multicellular organisms. Because of their potent effects, the production of these small regulators has itself to be tightly controlled. That is the key finding of a new study performed by Tübingen scientists at the Max Planck Institute for Developmental Biology. They identified a new component that modulates the production of micro RNAs in thale cress, Arabidopsis thaliana, by the removal of phosphate residues from a micro RNA-biogenesis enzyme. This can be as quick as the turn of a switch, allowing the plant to adapt to changing conditions. In this study, the scientists combined advanced imaging for facile detection of plants with defective microRNA activity with whole genome sequencing for rapid identification of new mutations. The cell seems to thwart itself: Reading the DNA, a mobile messenger RNA is produced in the cell nucleus, exported to the cytoplasm where it serves as a blueprint for the production of proteins. At the same time, the cell is able to produce micro RNAs that, by binding to specific messenger RNAs, can block protein production or even initiate its destruction. But why does the cell start a costly process and immediately stops it? "Well, the answer lies on the fine balance the cell has to achieve between producing a protein and avoid having an excess of it. Reaching the right level of a protein and its adequate temporal and spatial distribution requires, sometimes, opposed forces," says Pablo Manavella, first author of the study and postdoc in the department of Detlef Weigel at the Max Planck Institute for Developmental Biology. "Once the transcript of the messenger RNA is activated it is quite stable. If you need a quick stop, regulatory mechanisms, such as the micro RNAs, will be able to hold up the process," he explains. The study (Cell, "Fast-forward genetics identifies plant CPL phosphatases as regulators of miRNA processing factor HYL 1") was carried out in collaboration with scientists from the Center for Plant Molecular Biology (ZMBP) and the Proteome Center of the University of Tübingen. The production of micro RNAs from its precursors has already been extensively studied, especially in animal cells. "Micro RNAs in plants have evolved in parallel and independently. We had to assume that they could be processed in a different way," Pablo Manavella explains. The scientists used a methodical trick to study the activity of micro RNAs in cells of thale cress plants. First, they developed a reporter system based on the bioluminescent protein luciferase from firefly; its DNA was integrated in the plant cells. Secondly, the scientists inserted in the plant genome a fragment of DNA containing a precursor of an artificial micro RNA that specifically inhibits luciferase. These plants thus initially showed no light emission despite containing the genes encoding luciferase. In a mass experiment, the scientists then triggered unspecific mutations in thousands of plants. With the aid of a special hypersensitive camera the few shining plants were sorted out. "In all these individuals some part of the micro RNA pathway must have been damaged so that luciferase was no longer silenced by the artificial micro RNA," says Pablo Manavella. To identify the genes responsible for the failure in silencing luciferase, the scientists made use of a new technology developed at the Max Planck Institute, which enables the rapid detection of causal mutations by whole-genome sequence analysis. "Just a few years ago, this project would have been difficult to complete within two years. Nowadays, whole genome sequencing is a rapid and affordable method. By combining the screening test on luciferase activity with whole genome sequencing we could reduce the study period from years to several months," Pablo Manavella explains. Among the obtained mutants the scientists identified the phosphatase CPL1 as a key component of the microRNA biogenesis pathway. This protein modulates the production of these molecules by removing phosphate residues from HYL1, one of the main co-factors in the pathway, impairing the production of micro RNAs. Once produced these micro RNAs will bind to the corresponding messenger RNAs stopping the production of the protein. "We have identified one factor able to regulate the activity of the regulators," Pablo Manavella summarizes their results. Micro RNAs represent only one of the of genetic regulation mechanisms among many others; however, in the manner of a switch they provide quick and efficient answers to changing requirements, for example in many developmental processes. 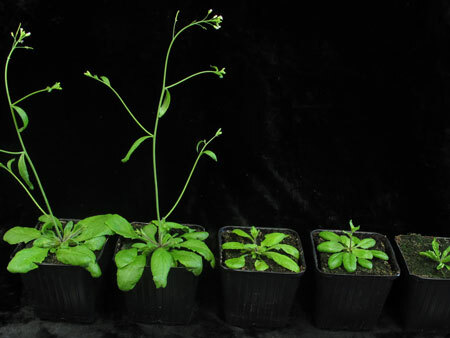 In general, micro RNAs in plants are much more specific than in animals, the scientists say. "Plants cannot run away when facing a stressful condition. Therefore they need quick ways to regulate its genes in order to adapt to such situations."